This file includes 3 different types of matching activities. 1. Trace the line to match the owl to the matching crayon. 2. 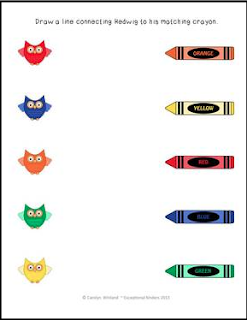 Connect the owl to the matching crayon. 3. Matching card game. Cut the owl cards and the crayon cards apart and practice matching them.